Insulating a home doesn’t only control temperature fluctuation, but saves homeowners money and energy. Heat flows naturally from warmer to cooler space. In winter, the heat moves directly from all heated living spaces to the outdoors and above your ceiling, garage, or wherever there is a difference in temperature. During summer, heat moves from the outdoors to the interior of your home, causing it to overheat. To maintain comfort, the heat lost in winter must be replaced with a heating system and the heat gained in summer can be removed by an air conditioner, but it can be costly. However, insulating ceilings, walls and floors decreases the heating or cooling needed by providing an effective resistance to the flow of heat. There are various options available when it comes to insulating a ceiling. These include blanket and batt insulation, such as Aerolite (fibre glass) or Isotherm (polyester fibre made from recycled plastic); loose fill insulation, such as Thermguard (made from recycled newsprint); or rigid insulation, such as IsoBoard. With the installation of modern machinery from the United States, Thermguard has been able to reduce the density of the product by 20%. This allows more air to be trapped between the fibres giving the customer, a lighter, less expensive product with superior insulation values. The cellulose fibre is loose-fill insulation and is blown onto the ceiling. As a result it gets into all the hard to reach nooks and crannies of your roof, providing a totally seamless blanket where no heat gains and losses can occur. Any gaps in roof insulation would reduce its effectiveness, but with Thermguard, you will never have this problem. 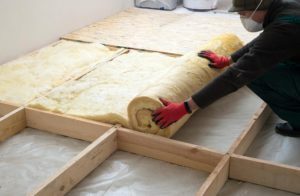 Cellulose fibre is a very effective soundproofing material and Thermguard is four times as dense as glass fibre and therefore has excellent acoustic values. When installed at 100mm, and thicker, Thermguard will have a Noise Reduction Co-efficient of .80 – .90. This means that .80 – .90 of the sound will be absorbed by the insulation. Thermguard is treated with fire retardant additives and withstands the heat of a blow lamp without melting or emitting noxious fumes. The additives in Thermguard, while harmless to humans, irritate insects and rodents, hence they will not live in the fibres. As a result, fitting the product is actually an effective form of pest control in your roof. IsoBoard thermal insulation is a high density, extruded polystyrene rigid insulation board. The insulation boards can be installed as a ceiling, doing two jobs at once – saving you time and money. They can also be installed over an old, existing ceiling – a simple DIY job that will result in a new ceiling, with insulation. In addition, the boards can be installed over truss in exposed wooden truss ceilings. IsoBoard provides good resistance to heat flow, keeping your home cool in summer and warm in winter – making it a green and cost-effective option for your home. It is also durable and contains self-extinguishing fire retardants, non-flammable blowing gasses and will not propagate fire in exposed roof applications. It also does not absorb moisture, and so is mould resistant. Lightweight and easy to install, the boards are available in a bevelled edge finish, which gives a clean, simple look and Isopine, which looks like timber. Ceiling insulation can prevent a 20-35% loss of heat and coolness in your home. By reducing heat transfer through a ceiling, you reduce the amount of power needed to warm or cool a home. South Africa is divided into six climatic zones – so check your zone and the recommended R-value for insulating material (the product’s ability to resist the transfer of heat) before you buy. Think Pink Aerolite is Isover’s thermal and acoustic ceiling insulation solution that reduces the amount of energy required to maintain a comfortable living environment. The product is lightweight and easy to use. Aerolite has a variety of thicknesses for each climatic zone that complies with the requirements in SANS 10400-XA. All new homes built will now legally have to include thermal insulation in terms of the Act. It costs about R35 to R40 per square metre. The main purpose is to constrict air flow between rooms. To insulate a room, it is important to start by making sure that doors between air-conditioned and non-air-conditioned spaces are closed at all times. Use automatic doors, self-closing doors and air curtains if possible. Installing a simple spring or gas strut can keep the main entrance of a home closed when not in use however, if a person has good discipline and can adapt a habit of closing doors, you never have to install any of these measures. The next important step is to seal cracks and broken windows that allow air to escape. Check along cornices and fill openings with silicone or use expanding foam for larger openings. Sealing these areas also keeps dust from infiltrating a home. Install blinds and awnings to reduce the amount of sunlight penetrating rooms through windows in summer. By opening them in winter, more heat is allowed in, reducing the need for heating. These should be closed at night when the outside air is cooler than the inside. In areas that have high levels of natural light, switch off electric lights. The natural light will help to heat rooms. Replace incandescent bulbs with compact fluorescent lamps (CFLs) or LED lights. Incandescent bulbs don’t only use a lot more energy; they also give off heat, which again can overheat a room in summer. There are various other ways to insulate a home that will cost more. Wall and ceiling insulation and double glazed windows reduce heat loss significantly. Insulating materials act as radiant barriers, convective barriers and conductive barriers. Radiant barriers are unlike mass insulation, which only slows down or resists heat transfer. Radiant barriers reflect heat instead of absorbing it or letting it pass through. They work on the same principle as wrapping a baked potato in aluminium foil to keep it warm longer by holding in the heat. Covering a home with a radiant barrier retains its heat. In winter it works just like a space blanket, which, although very thin and lightweight, holds body heat in. The advantage of this is that a thin space blanket can keep you warmer than several heavy blankets. Heat flows by conduction from a hotter location within a material or assembly to a colder location. Heat transfer by convection occurs when a liquid or gas is heated by a surface, it becomes less dense and rises (natural convection), or when a moving stream of air absorbs heat from a warmer surface (forced convection). Double glazing is the glazing process in which a window is formed by two panes of glass with a space between them. The space between the glass is usually several millimetres thick. Air is trapped between the panes and forms a layer of insulation. Before the unit is sealed, a drying agent is added to ensure that no moisture is present inside the finished glass unit. Around 60% of heat loss in the home occurs through standard, single pane windows. Double glazing substantially stops heat loss, and will pay for itself very quickly in terms of money saved on heating. Double glazing should decrease heating costs by 10-12%. Insulating your geyser and hot water pipes can save more than 40% on water heating costs. A geyser blanket helps to reduce the number of heating cycles the geyser has by retaining the heat for longer periods. In Isover’s Geyser Insulation pack, you’ll find a flexible foil-faced glass wool insulation blanket, tape and five 1m snap-on pipes to fit over the hot water piping. The resistance to heat flow is measured in ‘R-value’. The higher the R-value, the greater the insulation power. The R-value has to be disclosed for most insulation products.